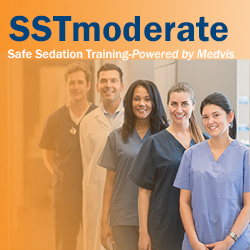 Safe Sedation Training for Moderate Sedation (SSTmoderate) provides educational content based on the current guidelines for safe sedation at a moderate level. Developed by practicing physician anesthesiologists, the course is designed to provide convenient, user-friendly sedation training for every member of the care team. Non-anesthesiologist physicians, dentists, nurses and other medical providers may be required to provide patients with moderate sedation, sometimes referred to as conscious sedation, as part of treatment. To do this safely, it is imperative that these professionals receive adequate training, often as a component of a local privileging or credentialing process. Skip the classroom and complete the course in five hours or less. Expand your learning with this highly interactive, educational curriculum. Recently updated to provide you with the most up to date information and guidelines for moderate analgesia and sedation. Group discounts are available! Interested in purchasing 31+ licenses? Contact Nate Wicks at (847) 268-9214 or n.wicks@asahq.org to learn more. The American Society of Anesthesiologist designates this enduring material activity for 5 AMA PRA Category 1 Credits™. Physicians should claim only the credit commensurate with the extent of their participation in the activity. This continuing nursing education activity was approved by Montana Nurses Association, an accredited approver with distinction by the American Nurses Credentialing Center’s Commission on Accreditation. Criteria for successful completion of this program includes receiving an 85% or greater passing score and completing the program evaluation. This activity has been designed to meet the needs of physicians and other healthcare professionals who care for and who may be involved in the diagnosis, management, and treatment of patients. Talmage Egan M.D., Ken Johnson M.D., Diane Tyler R.N. M.S., Sean Runnels M.D., James Agutter, M. Arch., Noah Syroid M.S. ; David Martin M.D., Charles Anderson M.D., Grant Lynde M.D., Mark Singleton M.D., Steve Lindauer M.D., Teodora Nicolescu M.D. Non-anesthesiologist physicians will want to know and use the most current practice to provide safe and effective moderate sedation to their patients. Make Safe Sedation Training the basis for credentialing at your facility with Safe Sedation Training - Moderate Sedation (SSTmoderate). Group discounts available! Please note, for those looking to move on to the Deep Sedation program, completion of SSTmoderate within two years is required for access. PLEASE NOTE: Your group discount will automatically be applied at the time of checkout. Contact Nate Wicks, Senior Group and Hospital Solutions Manager at (847) 268-9214 or n.wicks@asahq.org for more information. For product or post-purchase group enrollment (>1 licenses) information contact, Matthew McNutt, Simulation Education Coordinator, at (847) 268-9271 or m.mcnutt@asahq.org.